Remember - 90% wave of band saw blades is because of the wrong saw tooth setting! Rotating blade back support prevents the formation of risks. In order to avoid skewing during installation height indicator platform (height farmed part of the tooth), the movement of the platform is made by only one screw. To ensure the tooth bending farmed in a broken line, and not as a radially movable conventional machines, work area fixed base plate has a removable рardened insert. To avoid the formation of generating (pits) and the constancy of the indicator into any touch point is set indicator red-hot tip having a polished (with a thickness difference of 0.01mm over the entire surface), but not machined (a difference of 0.1 mm) end. While driving to the saw teeth are not cut tip of the indicator in the stationary base plate with 2 pneumatic ball. To ensure constancy of the pusher pushing the point is made as a truncated cone with the rotating ball bearing on the end of. Pusher moves and not directly to the radius. This greatly reduces the stress-breaking, allowing tooth setting without breaking off the tips of the teeth of even heavily incandescence. But it should always be remembered that tooth setting should be done not one strong but 2-3 weak movements. To prevent tooth breaking during with strong push (especially hardened tooth) machine has force limiter. Differences of RS 30/60 from other manufacturers. Saw body pressed fixed very well inside machine That prevent saw body from bend and as a result give you tooth set with perfect accuracy. You can pull the machine handle for check and allways see one and only value. 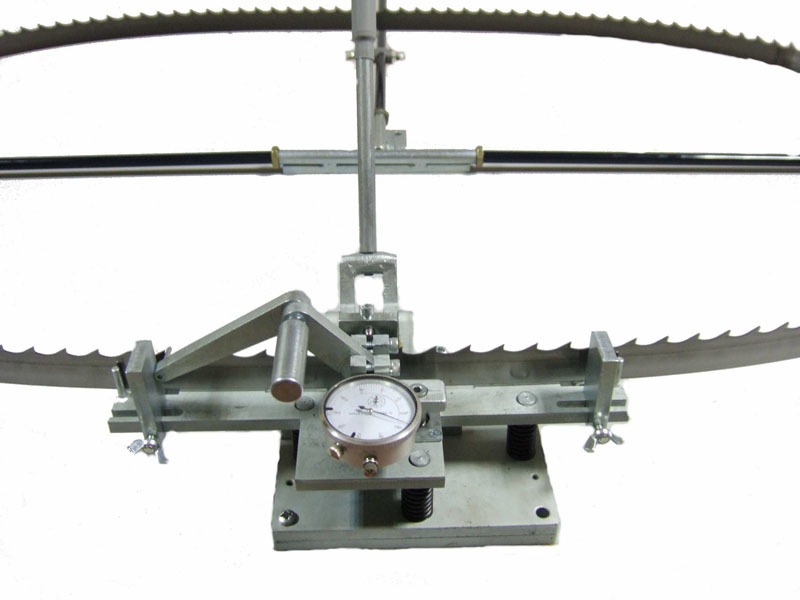 Saw should be clamped by two parallel plates while tooth setting process and keep them two spring-loaded thrust pins , but the plate is almost always not parallel and spring pins are always weak. You get the swing effect : You push on the tooth, but instead tooth setting , the body pressed each time different, i.e. even if the same indicator readings real tooth setting result is unpredictable, thus accurately diluted saw teeth are impossible even in theory. So even blade after tooth set can immediately can go wavy. Clamping of needed tooth is always at the exact point and tooth pusher flex it via broken line-like but not like curve line. The pressure plate never not fit tightly to setting tooth, the process goes in an arc, and often from the lower trough, which makes even properly diluted tooth unstable in the cut (it just pushes) - Saw wave begins. Convenient adjustment of the machine for routing bandsaws height blade body - can accurately and quickly set the desired height of the tooth farmed. Adjustments are usually uncomfortable, and often simply not available, which does not allow to set each tooth at the desired height. Convenient pusher movable machine on three teeth with stops allows one touch, semi-automatic, fast and move the saw to put each tooth in exactly the same place, significantly speeding up the tooth setting process while maintaining the required accuracy. Pusher and stops are usually missing. Tooth set by-sight, so all the tooth that have been setted has different angles even with the same data on the display. Installed in some machines pusher three teeth without stops having backlash, so work of this machine unit becomes meaningless because not allow you to install each new tooth in the same fixed place exactly. First, separation is performed on one side of teeth of a saw. Saw then everted and separation is performed on the other side of the teeth of a saw. To start breeding teeth only need to set the desired height on the 1st tooth and install stops at step saws. Placing the following setting teeth bandsaw made in semi-automatic mode when driving pusher 3-minute tooth until it stops, ie not necessary to catch the hand position of each tooth individually. Tooth setting time with maximum accuracy after some practice should be 7-10 minutes with blade legth 4 m.
Tooth setting accuracy and in a result cutting quality is obtained through the use of clamping blade body type press. I.e. saw the body during a tooth setting process pressed not by weak spring-loaded clamping pins but by central plate so that guarantee you minimum variation value in the indicator scale. The result: a tooth setted blades on RS30/60 have accurate setted tooth - all of them, in which the cutting edges of the teeth are strictly in line and max difference of ± 1 in the indicator. Such tooth setted blades will work only well. Default setters always has effect of swings - when during pressing pusher on the tooth instead of bending the tooth begins to bend saw body, respectively, even if the same indicator readings real tooth setted result remains unknown. So when you push again and see at the indicator scale it will show you 10 or more points of difference between last time pushing. Therefore, even just tooth setted saw can immediately goes wavy. Machines for this variant most strongly promoted by vendors, because they like to facilitate the work by automatic tooth setting process or tooth setting process with two teeth at once on both sides of the blade. This is a very good advertising noodles for the ears of those who had not independently bred band saws. Those who at least once saw prepared to work knows that each tooth on a saw bred individually. Tooth always assigned a value greater pusher necessary tooth setting process. When retracting the pusher back tooth is always a certain value otpruzhinivaet ago. Even for one saw otpruzhinivanie back each individual tooth can range from 5 to 25 units of the indicator. Therefore sharpener almost always have to make 2-3 of depression, often to different values of each indicator (ie, with different strengths ), to obtain the desired value of tooth set. Also, there are teeth that springy worse than others , and even at 1-2 until the indicator is pressed as well on the teeth , they remain resilient for large values of the necessary tooth setting process and have to specifically turn down back. Therefore, even scrolling saw in such machines several times can not get an accurate tooth set. You should now be appreciated that the touch one well to dissolve and moreover two teeth at once is impossible. Even configured such machines are well spread on the indicator values can reach ± 10 units or more , and from the desired value. This is assuming that the saw cut will be good only if the difference in result of tooth setting process ± 2nd unit for all the teeth. If the difference in result of tooth setting process for some teeth to ± 5- units saw begins to cut fine, but quickly goes wavy. Unnecessarily part of the tooth is almost not involved in the process of cutting. If the difference in result of tooth setting process for some teeth is up to 5 units in a big way you will already see distinct thread on a lumber surface, which impairs salable products and therefore its price. Block such adjacent teeth can detract saw the knots to form waves , which further degrades the quality of the products. If the difference for some teeth of up to 5 units to the lower side portion of the teeth will stop working completely , increasing the burden on neighboring teeth . This is especially dangerous when nedorazvedeny several teeth in a row, then the next block for such a tooth, will constantly experience strong dynamic shocks that lead to the formation of waves in the knots , as well as accelerated formation of microcracks and eventually saw a quick break. Breeding saw on this machine must always know - you never get a good and garantee tooth set. It will always be unpredictable and respectively always unpredictable blade will work. Resource saws with this tooth set is sure to be strongly reduced. For clarity, can take a new hacksaw on wood and saw off the edge of the barrel and bundled 10-20cm in diameter. Then take the pliers and at least 5-10 sawtooth just unfold in different directions. Again cut off a part of the trunk and near what is called, feel the difference! !